This is the start of an extended holiday timed according to the 210 day Balinese calendar, when the deified ancestors descend for ten days and are presented with special offerings. 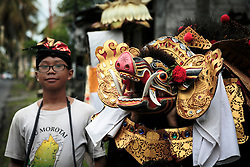 It is always on a Wednesday in the eleventh week of the Balinese year. Most businesses and schools close. 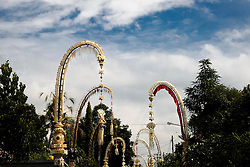 Villages are beautifully decorated with penjor, tall bamboo poles. 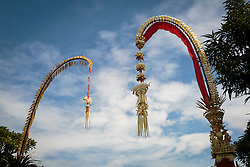 Each village has its own style of penjor. Special foods are eaten: tapé, a mildly alcoholic fermented rice pudding, special cakes, saté and lawar. According to an 11th century medical treatise the origin of Galungan began in the reign of King Jayakasunu. A smallpox epidemic had broken out and many died. The goddess of death, Durga, advised the king to hold an annual religious festival to appease the evil spirits. 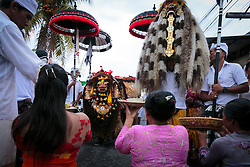 The same manuscript mentions the Barong and recommends that penjor are erected in front of households.